Stu (From Scotland | Working in Kyoto, Japan) on 22 December 2006 in Sport & Recreation. 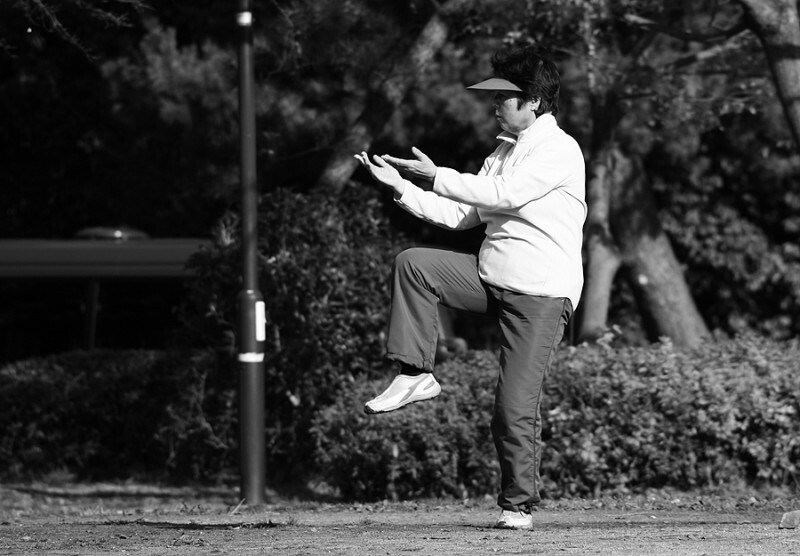 saw some people taking a tai-chi class in a park near my home on tuesday. couldn't believe my luck. maybe one or two more to come. Nice one Stu. Good capture. Sorry I can't say well my poor skill English please don't misunderstand... this one is ISO100 and previous one is ISO1600,so gariny image is make kind of film work. Of course clear image is very good and I like that but sometime too much clear and feel like "Digital" as for me. @H.O: thankyou so much for your input H.O. yeah, it was really sunny for this pic so could use iso 100. in the skateboarding pic it was already getting dark and i had to lighten it up during processing and it all added to that grainy look. tomorrows post is a little different though maybe. your advice is welcomed and appreciated. modern kung fu (wushu) fits really well with clear image, if you have the opportunity. thankx mnx. well thats a good question. i've been here for three and a half years and this is the first time i've seen this kind of thing. but then again, until recently i havent really been looking that hard. you might imagine that in japan this would be going on all the time but i havent seen it. you're probably right though - a grainier finish might've been better here. thanks for the input and will look out for the "wushu" that you mentioned. A nice candid shot! Interesting posture! Great work mate!!! I love Tai Chi it is really relaxing and you've captured her in a very difficult position. I love it. Great Job with this one and the photos you've posted recently have been great too. Thank you very much for being a regular visitor on my site...it's like I've got my own fan!!! Australia is a balmy 32 degrees every day much different from Kyoto I'd imagine.